Pre Central started a design contest for Palm mockups a while ago and among the finalists we found the Palm Twist model, created by Adam Wrigley. This handset sports concave sides, for easier grip, but its main appeal is the screen, that will rotate 90 degrees and reveal gaming controls, as shown in the image below. 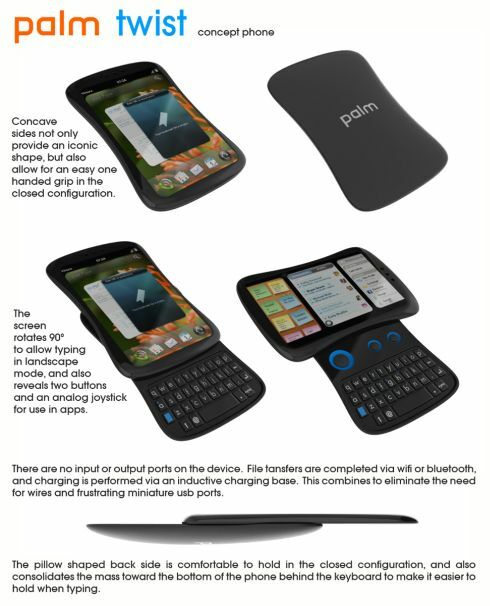 As you can see, you can use both landscape and portrait screen orientation on this Palm concept. The device also brings another innovation to the table: no input or output ports are included, so the phone relies completely on wireless connectivity, for transfers and even charging (via inductive charging base). Will this device win the contest? What do you say?